Snowmobiles are a fun way to play in the snow, provided you're being safe. Snowmobiles can be a fun way to explore the back country in winter. You can travel further than it’s possible on foot, especially in deep snow. They’re great for family fun when you want an outside activity that has the added bonus of beautiful winter scenery. They’re also a practical way to get around snowbound back roads that won’t see a plow any time soon. But are you keeping yourself safe enough while you snowmobile (and after)? Here are some quick tips to keep in mind when you’re having fun with a snowmobile this winter. Just because you’re traveling on a snowmobile doesn’t mean that you don’t have to follow traffic rules. If you’re traveling on a road, you must stay in your lane, stop at signs and lights, and behave responsibly. Not only are road rules a must from a legal standpoint, but they also keep you safe. Recently a snowmobile rider was killed, and another injured when the machine failed to stop at a sign in West Yellowstone. Even if you’re a snowmobile renter, not an owner, make sure you get training and information on safe operation before you set out. Snowmobilers who engage in “high marking” on snowy slopes (a practice of traveling in high arcs) can cause dangerous avalanches. The International Snowmobile Manufacturers Association (ISMA) notes that slopes of 30-60 degrees can easily cause avalanches. Riders should be very careful to avoid traveling on, or even parking at the bottom of steep slopes. Wearing an avalanche receiver, and being clear on your destination with those left at home, can help save riders in an emergency situation. Checking the local avalanche bulletin before you set out can help you plan the safest routes in snowy mountain conditions. Whether you’re renting or own your own snowmobile, it’s still likely that you don’t ride it daily. When you’re getting ready to travel by snowmobile, take care to check that the machine is in good working condition, fully fueled and doesn’t present any potential issues. You wouldn’t want to break down in the backcountry if you can help it, so make sure to have everything in order before you set out. If you’re getting on a snowmobile for the first time, make sure you know what you’re getting into. Inexpensive or even free online snowmobile training is available via videos, apps, instructional classes, manuals and more. Some states require adult snowmobile operators to complete certain courses before they get behind the wheel, so check with your area before you get going. While it’s often cold out when you’re on a snowmobile, it’s going to get colder when you get moving. Make sure you wear enough layers, have adequate snow protection if you get wet, and have emergency materials if needed. Helmets are always a good idea (though not always required by law), as are good snow goggles, thick (or layered) gloves, a snowsuit, sturdy snow boots, and lots of warm layers underneath. If you encounter wild animals, slow down! A herd of frosty elk, buffalo, deer or even a distant moose are wonderful rewards for getting out into the backcountry on a snowmobile, but you have to be careful. Threatened animals can charge, and on a snowmobile you’re very exposed. Going slow, staying seated, and being respectful of wild animals are the perfect ways to stay safe and make memories. In National Parks like Yellowstone or Yosemite, snowmobiles are required to stay on groomed roads that are shared with pedestrians, skiers, and drivers. Make sure you have the proper permits for your route, whether it’s on public or private property and obey all local, state, and federal laws regarding operation of a motor vehicle (e.g., don’t drink and snowmobile, don’t destroy property or trespass and don’t leave designated areas). While you’re at it, make sure your insurance fully covers your snowmobile fun, too. While your automobile collision insurance might help cover damage to your own snowmobile if you should hit something, it won’t help fix that struck fence or other vehicle. 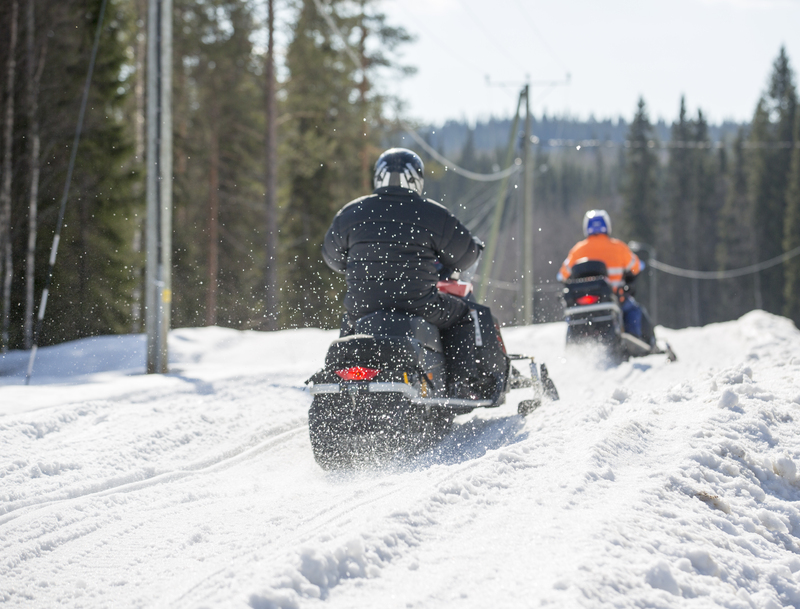 Liability insurance will help to pay medical bills if someone you strike on a snowmobile is injured. Comprehensive coverage can help if your snowmobile is damaged due to flood, theft, or even vandalism (but not a crash). Most important to snowmobile renters is the fact that most rental agreements only have some collision insurance, and it may not be more than your current auto policy already covers. Before you sign on that dotted line, check the language against your own auto policy to see if the extra fee is worth it (or not).